In 1980, the Congress Avenue Bridge underwent reconstruction. Shortly after the work was complete, thousands of Mexican Free-Tailed bats (Tadarida brasiliensis) decided it was an ideal place for a nursery colony and began living underneath the bridge. People reacted with alarm when they saw swarms of bats flying out from underneath the bridge every evening in the summer. But thanks to the marvelous educational efforts of Bat Conservation International, the citizens of Austin learned that the bats weren’t dangerous, and that they were extremely beneficial insect eaters and pollinators. Austin quickly began to appreciate the bat colony. Protected, it grew to become a huge tourist attraction: some 100,000 people visit it yearly to see the evening emergence. There were over 100 people out with us Monday night: parents with children, tourists from other countries, vendors selling souvenirs. It was amazing to see such community support for a much-maligned animal. 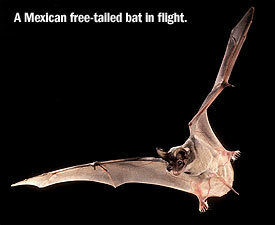 Mexican free-tailed bats are widely distributed throughout the southern United States and Central and South America. They are migratory; the Austin colony lives in Mexico during the winter, returning to the bridge each year to roost their young pups. Remarkably, mothers returning from their nightly feed are able to identify their pups out of the millions of bats in the colony by scent and sound. Here is a baby Mexican free-tailed bat. Can you hear him vocalizing? You might see me there some evenings!